I used to think I was doomed forever to have short nails. I was a tomboy growing up, and then spent a huge amount of my teenage years on a farm, so they were always short and scruffy. Even when I got into nail art, they were still short and a bit terrible, although I tried my best with what I had. It clearly didn't work though - sorting out blog comments recently I saw one on an old nail art tutorial that just said - 'this is terrible! why would you share this?'. Er, indeed. 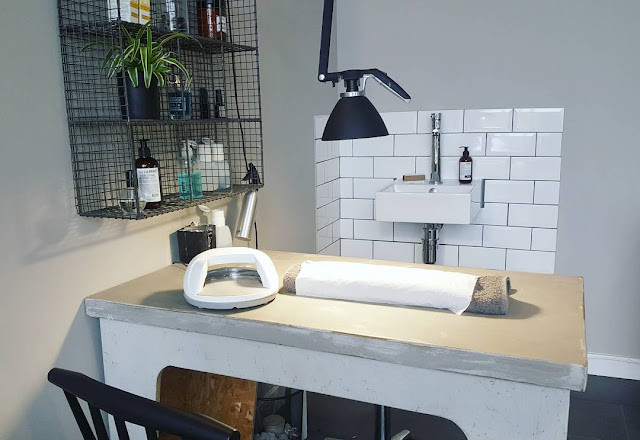 I was clearly in need of a bit of a miracle, so enter Edinburgh indie salon Buff nails, who have come to my rescue and made my dreams of taloned nails come true! 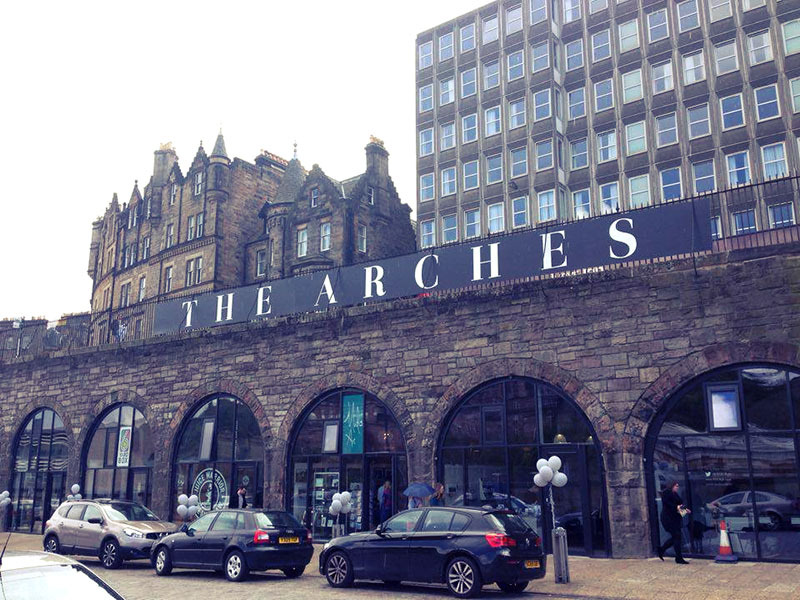 Buff is based in The Arches at New Waverley, a super cool street of renovated Victorian arches, that also houses a donuterie, a juice bar, coffee shops, cool bars, a make up studio and other hipster delights. Buff is a design-led nail workshop, that aims to offer an innovative manicure experience. The space is lovely, it's quite industrial and quirky, and fits their super-cool but super-nice Scandi vibe perfectly. I first started going a year ago, when I was in need of some serious treat yo' self times and haven't looked back. I'd never had shellac on my nails before and was weirdly well nervous about it (imagining that it would all flake off, or they'd get really damaged, or it would be a nightmare to remove), but no. It turns out that shellac is exactly what I've been missing my whole life, and my nails are stronger and longer than ever. I reckon it's partly down to the fact that it lasts for ages - I get three weeks of chip-free shiny polish now, whereas before I was painting my nails all the time, which must have dried them out pretty badly. Buff have a good rep for custom nail art designs, so on top of getting a manicure (which costs £30) you can add on custom art for only £5 extra! I have fully taken advantage of this and they are so nice and willing to accommodate your requests (even when they are obviously going to take an age). It's hard to choose, but I think my favourite nails were my pastel ombre rainbow nails (thanks to the very patient @buffcshelen! 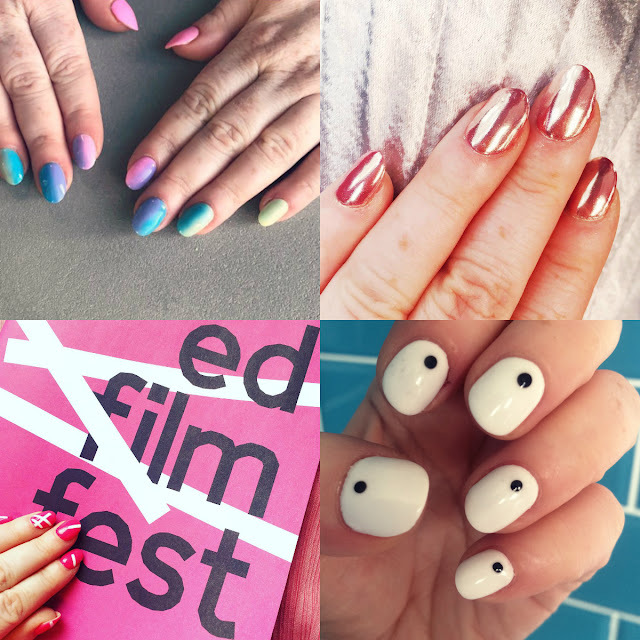 ), followed by the custom edfilmfest nails they painted for the festival's programme launch. Over the last year I've had holographic nails, chrome nails, polka dots, pastel fades, geometric shapes, you name it - the hardest part is choosing what to get, knowing how long it will last! I'm totally hooked. I feel so much more put together with a glossy manicure, it's the only beauty treatment I get regularly and I love it. 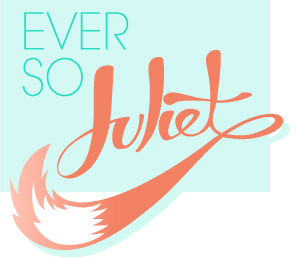 You can check out more of Buff's work on twitter, insta and facebook, and (hooray) book appointments online.